Vertical Japan: Are your ice tools right for you? Are your ice tools right for you? While sharpening things for my next trip (Sounkyo, hopefully) I was suddenly surprised at how far my ice tools had come from their 'out of the box' appearance. So here's a simple question: are your ice tools exactly right for you? If they're not, and I'd wager that's the case, then here's the answer: make them right! A lot of people seem to baby their tools. Unless you're being paid to model for the latest Black Diamond catalogue, this is the wrong approach. The sooner you get the 'shiny new toy' phase over with, the quicker you can get on with viewing them for what they really are: TOOLS! I climb with (2011-) Petzl Quarks. 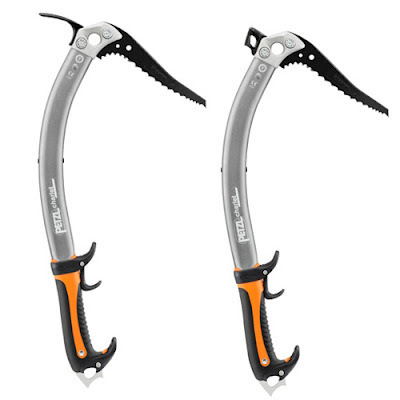 They're superb axes (and hey, Petzl didn't screw them up like the new Nomics!) but out of the box, for my tastes, they could be improved. I'd bet that's the same for anyone, whether you climb on hand-me-down DMM Flys or the latest Grivel carbon competiton tools. So don't be scared - make your tools yours and get the most out of them. They'll almost certainly still climb harder than you! Removed triggers from Trigrests. I found I didn't move only my index finger up much, but I did match on the tools quite a lot. Now I can fix the Trigrests overall lower, making for more stable matching, without the triggers in the way of the standard grip. I don't miss the ability to move them. Added 6mm cord loops (tied with double fisherman's) to provide more flexible umbilical attachment points. Added tennis racket grip tape to the shafts for grip and insulation when matching and daggering - gaffer tape low down is both to hold the end flat and to pad out the Trigrests a little. Removed adze from one tool, kept one hammer. One hammer is enough (why carry the weight of both?) 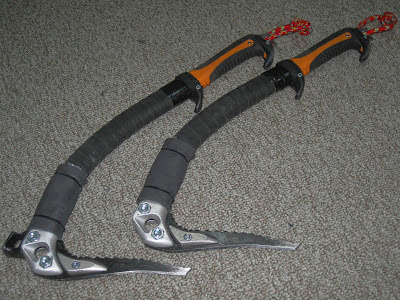 and adzes are more of a liability when on pure ice routes. The balance is slightly different between tools, but not enough to fuss about. Added pick weights - for a better swing and more reliable first-time sticks on pure ice. Added thin foam to upper shaft for insulation when daggering up high for long periods. I'd be lying if I said any of the above tweaks were my own original idea - I've borrowed ideas from all over - but the resulting tools are perfect for me, right now, doing what I am doing. Can't ask for more than that. Sounkyo - here we go again! Crampons and boots - open your mind! Kaikoma - here we go! © 2012 Vertical Japan. All Rights Reserved. Powered by Blogger.